Lower levels of vitamin D circulating in the bloodstream are tied to a higher risk of developing diabetes in a new study of Australian adults. After following more than 5,000 people for 5 years, the researchers found those with lower than average vitamin D levels had a 57 percent increased risk of developing type 2 diabetes compared to people with levels in the recommended range. "Studies like ours have suggested that blood levels of vitamin D higher than what is recommended for bone health may be necessary to reduce the risk of developing type 2 diabetes," said lead author Dr. Claudia Gagnon, a fellow at the Western Hospital at the University of Melbourne in Australia when the study was done. Vitamin D is manufactured by the body in response to sunlight and also occurs naturally in some foods, like eggs, cod and salmon. The vitamin is best known for its role in working with calcium to build bones. The Institute of Medicine recommends that adults get about 600 IU of vitamin D a day to maintain circulating levels in the desirable range. Past studies have shown that vitamin D may also help keep blood sugar levels under control (see Reuters Health story of February 23, 2011). In type 2 diabetes, the most common form of the disease, the body can't use insulin it produces efficiently to control blood sugar levels. Vitamin D may play a role by increasing the release of insulin, Gagnon said. 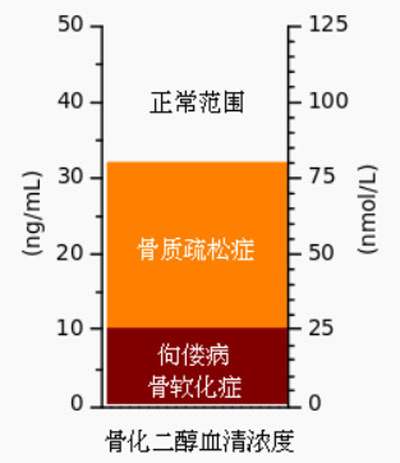 insulin sensitivity and diabetes risk, Gagnon's team measured the vitamin D blood levels of 5,200 people without diabetes. After 5 years, about 200 of them had developed diabetes, and the researchers measured everyone's vitamin D levels again. The researchers found that twice as many people (6 in 100) with low blood levels of vitamin D later developed diabetes, compared to those with blood levels in the normal range (3 in 100). When the researchers took into consideration risk factors for diabetes such as age, waist circumference, and a family history of the disease, the increased risk from low D levels translated to 57 percent, relative to those with higher levels. Calcium is also thought to participate in insulin release, but the researchers found no link between the mineral and risk of developing diabetes later. "Lower levels of vitamin D in the blood were associated with an increased risk of developing type 2 diabetes," Gagnon told Reuters Health by e-mail. "However, our findings do not prove cause and effect." Further studies are needed, Gagnon's group writes in the journal Diabetes Care, both to directly test whether vitamin D supplements make a difference in diabetes risk, and if so, to determine the optimal circulating D levels to minimize that risk. It's hard to know what exactly the link between vitamin D and diabetes is, Dr. Ian de Boer, assistant professor of medicine at the University of Washington in Seattle, told Reuters Health. But obesity and inactivity, the highest risk factors for type 2 diabetes, may be the cause of low vitamin D levels, said de Boer, who did not work on the Australian study. 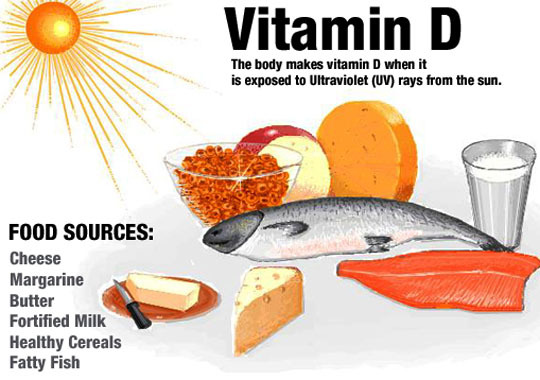 Vitamin D has also been linked to lower risks of asthma, heart disease, and certain cancers. However, there hasn't been much evidence showing that taking supplements helps these conditions. 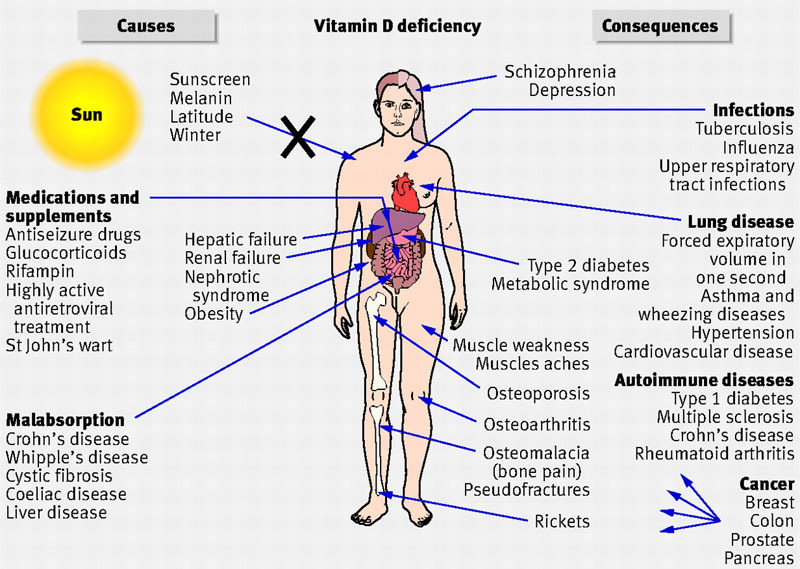 Vitamin D is widely available for less than $10 for a 2-month supply. The sun is the major vitamin D source for most people, but salmon and fortified dairy products also contain a lot, de Boer added. The best ways to reduce diabetes risk are still to exercise and eat a healthy diet, he said. "I don't think there's conclusive information that supplementing with vitamin D reduces diabetes risk," de Boer said.